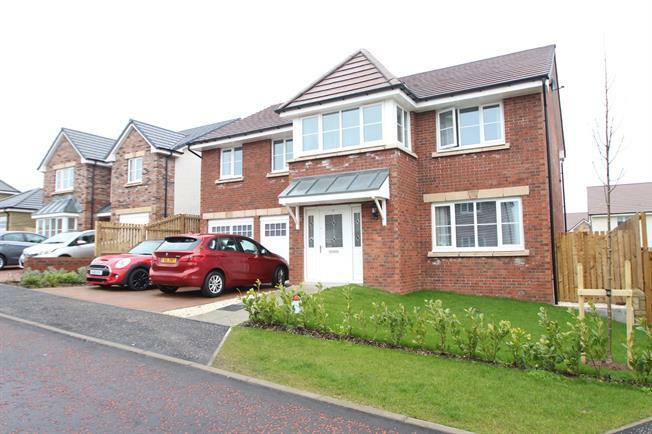 5 Bedroom Detached For Sale in Strathaven for Fixed Price £365,000. Stewart Milne built detached villa within locally admired Colinhill Grange development. This model, The Noblewood offers sizeable accommodation arranged over two levels as follows: welcoming reception hall, lounge, vast open plan family room/dining room/kitchen arrangement with two sets of French doors leading to the gardens, utility room and WC. The upper level includes study area, master bedroom with walk in wardrobe and en-suite bathroom, four further generously sized bedrooms, guest with additional en-suite and family bathroom. The high specification finish includes double glazing, gas central heating and the remainder of both the Stewart Milne guarantee and the NHBC warranty. Substantial garden grounds are mainly laid to lawn and incorporate an expansive driveway leading to the double integral garage. The setting offers attractive outlooks and is ideally placed for ease of access to a wide variety of Strathaven amenities including quality schooling.